ECM fan and pump motors provide numerous performance gains over traditional PSC motors ranging from electrical savings, reduced starting current, modulating capability, and longer equipment lifespan. Intelligent motor control technologies make these performance gains possible in addition to adding a variety of programmed functionality benefits. To use the analogy of driving a car, PSC motors operate on-off, similar to a driver who is either flooring the accelerator pedal or hitting the brakes. Conversely, ECMs modulate their speed to the load, similar to how a car on cruise control only requires incremental adjustments to maintain a steady speed. This results in higher efficiency and less wear on parts. ECM pump or fan motors are available with 120 / 230 volt, single-phase input. Typical sizes range from residential zone circulators to 200 gpm commercial sized units, from 1/25 hp up to 2 hp. Pumps larger than 2hp for larger applications will generally be built with 3 phase motors which utilize Variable Frequency Drives (VFD) to provide speed control. 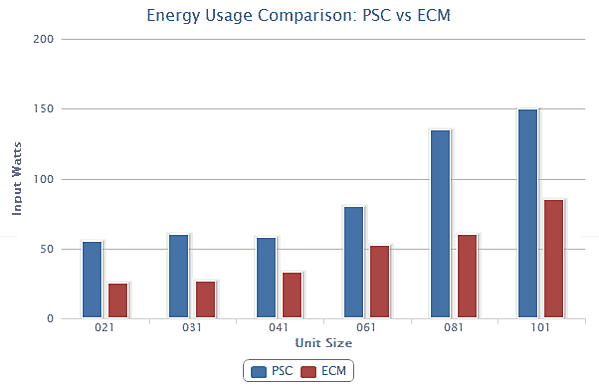 PSCs have few options for speed control, most of which cause loss of efficiency. By comparison, ECM motor speed is controlled by an internal microprocessor, providing different methods to control the speed of the pump depending on the application. The control method also maintains the motor in an optimum efficiency state. A simple control method uses a switch on the motor to select a speed, usually with 3 settings to choose from. Most ECM pumps on the market today include some type of sensors to monitor differential temperature or pressure. Internal microprocessors will calculate and adjust fan or pump speed to maintain a desired setpoint, minimizing electricity use. Some ECM pumps can intelligently learn trends and modify their operation based on historical operational loads and schedules. Building DDC systems can send a standard 4-20ma signal to an ECM motor to ramp up or down rotational speed depending on various system sensors and DDC programming. Pumps and fans are sized to provide the necessary water or air flow during peak loading, which occurs during a relatively few number of hours per year compared to total hours of operation. 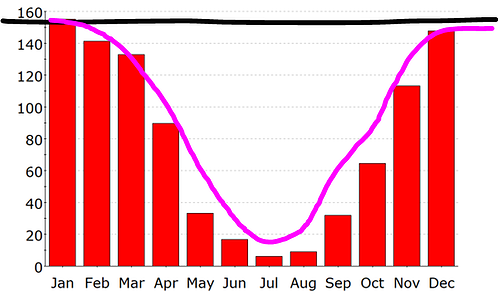 The graph below represents heat load of a small commercial building over the course of the year. The black line is the speed of a PSC fan or pump motor, which spins at 100% regardless of the heating demands of the space. The magenta line shows the relative speed of an ECM fan or pump motor, which can use internal sensors and microprocessor to adjust its speed to match the load. Speeds are reduced when heating loads are less than peak thereby minimizing pump cycling and electrical consumption. Affinity laws calculate power (watts) as the cube of the rotational speed. Annual energy savings up to 75% are possible with an ECM which can reduce speed to match the seasonal load. The on-board microprocessors allow manufacturer’s to program features to ensure longevity of the motor. Soft start allows the motor to ramp up to speed when it begins to operate, eliminating noisy starts and vibrations. This also takes mechanical stress off of the motor, bearings, and seals. Locked rotor sensors shut down the motor if the rotor fails to spin from debris in the pipe or similar issue. Some manufacturers program the motor to attempt to alternate between forward and reverse in an attempt to clear the blockage without the need for a service call. Pumps will automatically cycle the motor for a short period of time during the off-season to ensure the pump will be ready for it next call for heating or cooling. ECM pumps do have a higher cost, summarized below. 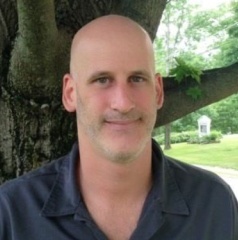 In Vermont, Efficiency VT is providing incentives toward the purchase of ECM pumps which get the cost very close to that of a standard PSC pump. Even without the Efficiency VT incentive, the payback of the ECM pump due to electricity savings is usually between 1 and 2 years. 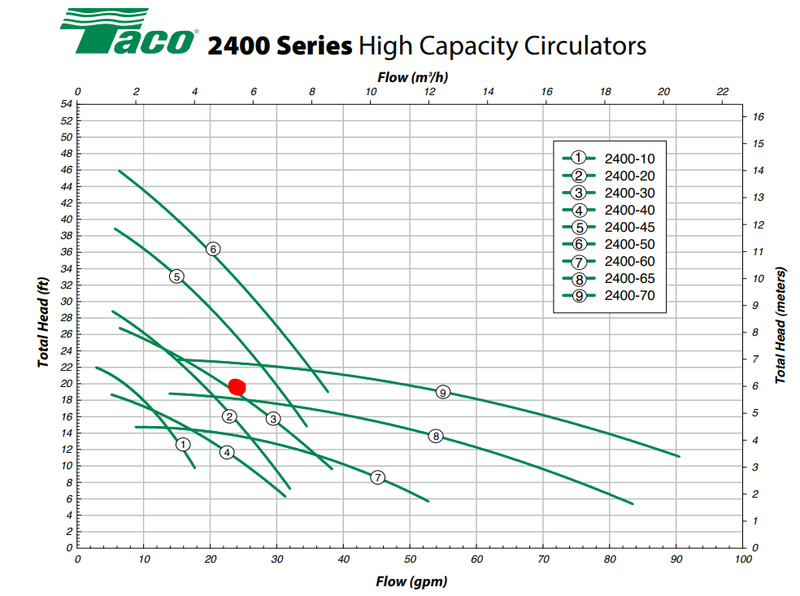 The following pump curves represent potential selections for a system requiring 25 gpm flow at 20 ft of head. The first is a Taco PSC pump  and the second is a Taco Viridian ECM pump . Specs: Taco PSC 2400-45, 1ph, Watts 250 (fixed speed). Annual operating cost: $180 (assumes 4000 hours per year at full speed). Specs: Taco ECM Viridian 3452, 1ph, Watts 10-180 (variable speed). 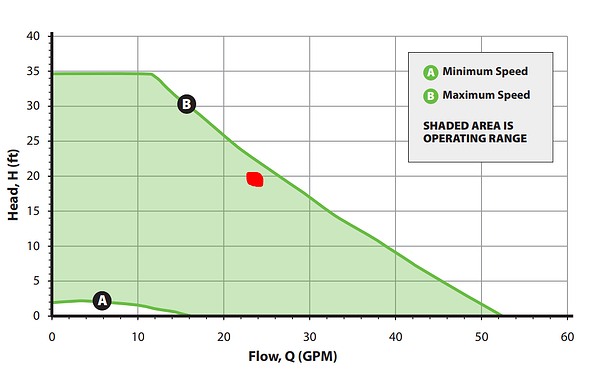 This ECM pump will adjust speed and torque to operate efficiently at all flow and head combinations located in the green shaded area which will provide additional efficiency savings, typically up to 75%. There are numerous HVAC applications which can benefit from ECM pump and fan motors. When selecting single-phase motors for fractional hp sizes up to 2hp, consider the additional benefits of programming functionality, speed adjustment, motor protection, and electricity savings that electrically commutated motors are capable of providing over PSC alternatives.